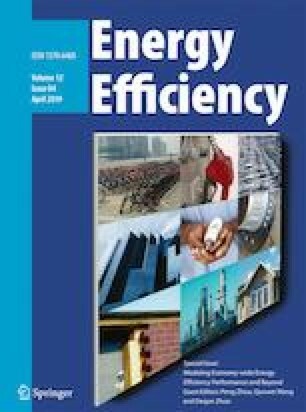 To make energy efficiency policies for consumers, changes in the demands for multiple goods or services and the corresponding cumulative energy consumptions should be considered together to estimate residential rebound effects. A hybrid methodology, which combines the consumer’s expenditure re-allocation with cumulative energy consumption through integrating a re-spending framework and an input–output analysis under different scenarios, is often used to estimate residential rebound effects. However, the specifications of the expenditure change caused by the re-spending effect are controversial. By introducing the Hicks decomposition of price effect both in absolute and elasticity forms, we have explained the re-spending effect and re-examined the hybrid methodology. We find that determinants such as the proportion of energy efficiency improvement, non-compensated price and income elasticities, income shares, cumulative energy intensities of each final demand, and energy intensity of investment would influence the combined rebound effect. We also find that the direct rebound effect may not be necessarily represented as the negative value of the own-price elasticity of energy service. The parameter of the extent to which the energy efficiency has improved and other energy intensity variables should also be considered. Thus, it would be risky to use only elasticity to indicate the direct rebound effect when the hybrid methodology is applied. We are grateful for the financial support provided by the China Natural Science Funding No. 71673134, Qing Lan Project, Six Talent Peaks Project of Jiangsu Province the Fundamental No. JY-036, and Research Funds for the Central Universities No. NE2018105.